On 5th of April 2018, at about 4:50pm, distress call was received at the Police Headquarters ilorin to the effect that Offa Police Station and Banks located within the business district of the town were under serious armed attack by men of the underworld. Reinforcement by men of Police Mobile Force, F- Sars, Explosive Ordinance Department (EOD) Anti-Terrorism Unit and Anti- Cultist Unit of the command were dispatched to Offa to deal with the situation. 1. Seventeen (17) persons comprising nine (9) policemen/women. Eight (8) civilians, all killed within the police station and the street/banks. 2. 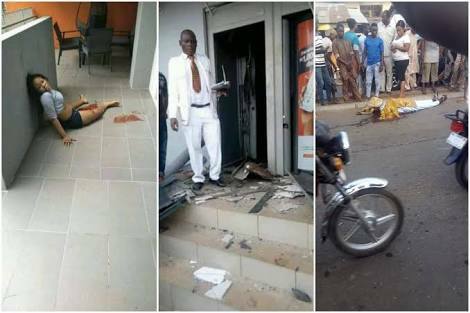 Five Banks and one finance houses were attacked, Union, Eco, Gtb, First, Zenith banks and one Ibolo micro finance banks. 3. Seven suspects arrested, one at Igosun road and six others at different locations in Offa, they are helping us in investigation. 4. Seven vehicles abandoned and recovered from the armed robbers. 5. Numbers of injured victims yet to be ascertained as they are receiving treatmentsin different hospitals. 6. Suffice to conclude that, as calous and as unfortunate as the attack was, the casualty figure in the incident was seventeen (17) and not thirty (30) as erroneously reported by some media platforms. 7. Some rifles were carted away by the robbers. In conclusion, the Inspector General of Police has ordered a full investigation and has directed his Intelligence Response Team and others to assist in getting the hoodlums arrested, while the Governor of Kwara state has promised a reward of 5million naira for anybody with information that may lead to the arrest of the suspects. The Command wishes to express its heartfelt condolences to the families and friends of the victims while also wishing the injured quick recovery.